In a blockbuster trade that was rumored since the trade deadline, Domi was finally moved to Montreal. Both teams win this trade. Well, the rumors regarding Max Domi of the Arizona Coyotes being traded finally came to fruition today. The Montreal Canadiens acquired him in exchange for forward Alex Galchenyuk. 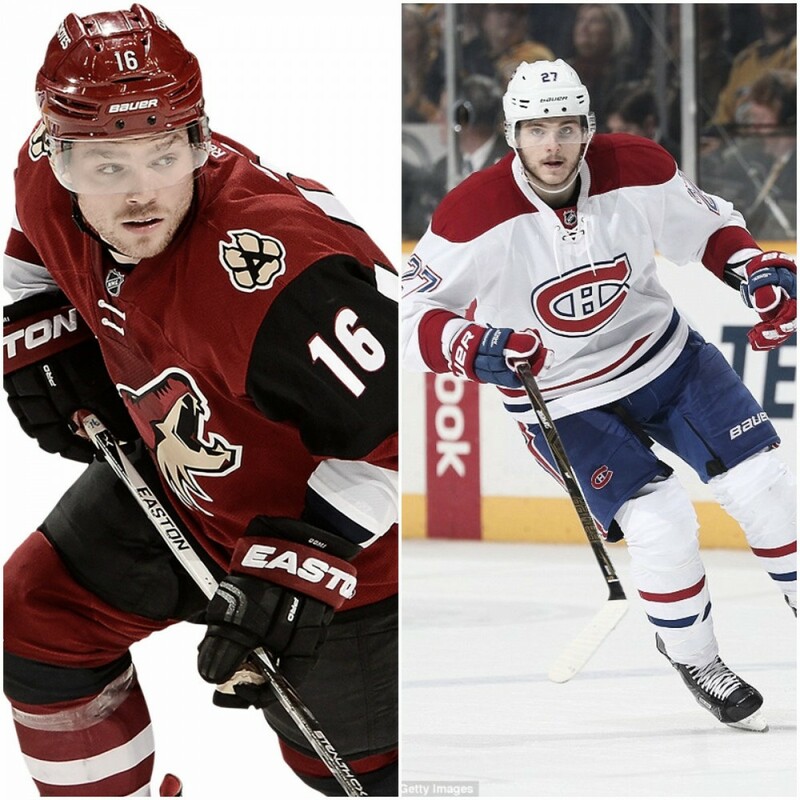 The news is a slight shock because after all the discussion and rumors of Domi going to the Pittsburgh Penguins among other teams, the one rumor of Montreal's interest held true. As it turns out, Montreal GM Marc Bergevin made a deal exactly one year ago to the day when he pulled off the Jonathan Drouin for Mikhail Sergachev deal. Both teams need to improve and the pressure on both GM's was increasing, especially in the Montreal press for some improvement. The Canadiens finished with 71 points and the Coyotes with just 70. The Montreal club was criticized heavily for being eliminated in the first round of the playoffs in 2016/17. Then, last season they were nowhere nearing even qualifying for the postseason. The Coyotes have not made the playoffs since their successful season in 2011/12, so they really feel things needed to change. Arizona's young President of Hockey Operations/GM John Chayka is continuing his process of improving his hockey team and this trade is no surprise to anyone who knows him. Domi who is a restricted free agent is expected to sign an extension with his new team in the next few days according to TSN's Darren Dreger. He finished his three-year entry-level contract which had an $863,333 cap hit. So, Montreal will definitely be giving him a raise to make the salaries work for this trade. Galchenyuk, 24 has two seasons remaining on his three-year $14.7 million contract he signed on July 5, 2017, with Montreal. This also brings the Coyotes up past the salary cap basement, while acquiring a bigger forward who knows how score. Domi averaged 12 goals, 33 assists over his three seasons with Arizona, and had a terrific rookie season giving the Coyotes hope that he would flourish and be a star player. After his great first season, his second campaign was injury-riddled when he only appeared in 59 games after injuring his hand in a fight. He only tallied 9 goals, 29 assists. This past season he had even worst luck and his shooting percentage plummeted to a low 6.0 percent. He repeated his goal output of just nine lamplighters and did recuperate from February on when he had 24 points in his last 28 games. In the end, that may have saved the trade value the Coyotes had for him, as Montreal sees him as a player they can build their future with in a quest to become a playoff contending team again. Galchenyuk has been in the NHL twice as long as Domi but is still young. He and Domi have the exact same points per game average of 0.61. Galchenyuk does average more goals than Domi with 18 per year. Another big difference for the struggling Arizona offense is his power play stats. He had nine extra-man goals and 15 assists on the power play and it looks like he will help in that area right off the bat. Domi has only scored five power play goals in his three NHL seasons. Galchenyuk collected 30 goals in his 2015/16 season, so you know that Chayka was licking his chops when the Canadiens offered him in this deal. For Domi, it seemed like ever since he and Anthony Duclair were split up, his play went south. For Galchenyuk, his playing time was limited and it never seemed like the team knew if they wanted to play him on the wing or at center. Both players can play either position and Chayka had this to say about acquiring Galchenyuk. So, sometimes it takes a change of scenery for two players to meet the expectations they were thought to possess. They're both young, budding future stars of the NHL. Now, we get to see just how each player does after a trade like this. For one thing, Galchenyuk won't need to bring any winter clothes with him (except for when he goes on the road to cold weather cities). From snow and ice and freezing cold temperatures to sunny, warm desert weather will be quite a change for him. Perhaps it will inspire him to be the player that Montreal drafted third overall in 2012. The increased size he possesses will definitely help the Coyotes' front line. He comes in at 6'1", 207lbs compared to Domi who is 5'10", 195lbs. Domi is more feisty and is not afraid to drop the gloves, and perhaps Montreal was intrigued by that quality and wanted his toughness to add to their front line. Both players are comparable but may play better with their new teams. Arizona gains size and some more scoring, while Montreal gets toughness and scoring potential... and maybe by making Domi a center they think their problems at that position may be gone. This also makes the draft in a week very interesting. Will the Canadiens draft the young Finnish center Jesperi Kotkaniemi? They can always see how Domi does at each position and place him where needed. With this trade, it seems apparent that the Coyotes will draft a defenseman since they've added to their offense. We'll all know in a week when the NHL Entry Draft takes place in Dallas. AND... at the draft party the Coyotes were hosting at Wild Horse Pass Resort one Max Domi who was scheduled to don the new Coyotes' uniform... will not be there to model the new threads. Max and his faithful dog Orion will be missed. Good luck to both as they venture northward. Stay warm. What is your impression of this trade? Do the Coyotes get more from it than the Canadiens? Tell us why in the comments section below.